Anything your heart desires will come to you! Harmony Hall and Beauty Beyond Drag Productions present.. 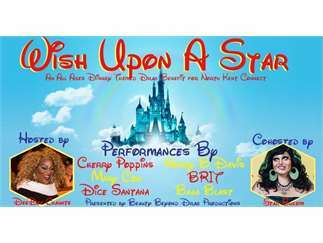 Wish Upon A Star - a Drag Benefit for the North Kent Connect! North Kent Connect is a Christian-based organization committed to improving the lives of all people in northern Kent County by providing access to basic needs and promoting economic independence. NKC seeks to love all people, regardless of background or circumstances. Their vision is a community of thriving people. North Kent Connect has pantries, classes, services for seniors, and much more. One thing we love is that they support healthy food initiatives! On March 30, 2019, we will be honoring this great organization through a night of Disney! We believe that all deserve the right to healthy food, and that is exactly what NKC is doing for northern Kent County. A portion of drink sales will be donated to North Kent Connect and $1 from every Harmony Hall beer will also be donated. ALL AGES. BRINGING YOUR CHILDREN IS HIGHLY ENCOURAGED! This is a free event. If you would like to make a monetary donation, please contact Bradley Haas or North Kent Connect. See you there!